Fifth German edition. This is the celebrated historico-geographical work in German, here in the first edition of Münster’s updated and enlarged final version. The Cosmographia is an epoch-making achievement by the great polymath Sebastian Münster (1488-1552). His geographical studies originated from his mathematical interest, especially from cartography. However, as he built his compilation on a wide variety of accounts by scholars from Germany and various European countries, a shift towards a historico-geographical approach was the consequence. Thus, notwithstanding the abundant cartographic material, the Cosmographia is foremost a work of historiography. It gained enormous success for decades as a 'housebook' of historical and geographical knowledge for a wide circle of readers in Germany and abroad. First printed in 1544 in German with about 540 woodcuts and 24 maps, the work was gradually extended, updated and translated. The present 1550 German edition was the final flowering of Münster's work, enlarged with additional information and illustration. While the Cosmographia was always profusely illustrated, the 1550 edition is enlarged by numerous double-page views and plans and contains some of the earliest published, large-scale views of European cities. 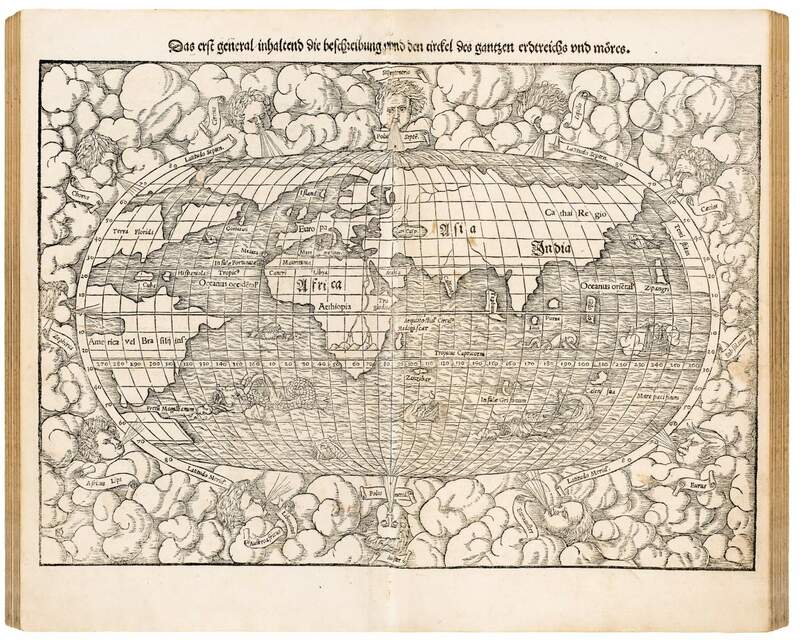 The fourteen double-page woodcut maps – drawn by Münster himself – include two world maps, the first of which are named Terra florida (North America) and America vel Brasilii ins. (South America), and the first general maps of the continents Europe, Asia, Africa, and America.